Introducing our suite of web service Telecom Application Programming Interface (API). Use this service for performing telecom infrastructure analysis within your site. Carriers, Tower companies, Web App programmers and Wireless Service Providers alike can immediately begin amping up their software with power from the Wireless Applications' cloud service. The following descriptions provide an overview of highlighted functions in the Telecom API suite. To fully explore the depth of functions available, call us for a demo, and/or just sign up for your free development key. In this category of calls, users may query our branded eCoverage product which provides RF propagation modeling of a radio signal over terrain. You can integrate the resulting graphical output of this radio broadcast coverage into your mapping software, web applications or other mapping API interface (such as Google or Bing). eCoverage generates a full Longley-Rice modeled propagation plot with lighting speed. Wireless Applications has developed the eCoverage software to be more intelligent, requiring only very simple input values while running complex math in our server farm. This allows both novice and experienced telecom personnel to quickly receive comprehensive results. Wireless Applications also provides the ability to query the resultant model of RF coverage geography for demographic census data (from population counts to age groups), highway traffic count and business counts! (Note these options are currently limited to the United States.) And finally, within this category, there are calls to generate FCC Height Above Average Terrain (HAAT) calculations using 30 meter DEMs. HAAT calculations are used for generating Carey Contours and TV Broadcast contours. Using this API call, you can generate genuine TV Contours, such as those used for computing 51 dBu (and/or other levels) that work great for analyzing TV broadcast white space and for performing interference inspections. Analyze the Line-of-Site (LOS) between two structures relative to terrain databases. Us our call to generate a path profile showing a 2-D slice through terrain which displays the microwave Fresnel zone clearances relative to the terrain in simple to read pictorial and\or in data formats. Our server farms include multiple worldwide terrain databases for users query from. Depending upon geographic location, DEM terrain is available with down to 10 meter resolution! We even include SRTM (Shuttle Radar Topography Mission) terrain database (down to 30 meters, depending upon geography) which is great data for identifying buildings or trees above DEM ground level. Many of our clients say this is an excellent method to truly analyze clutter. Also available in the US geography are calls for another layer normally called ‘Clutter Data' or formally, National Land Cover Database (NLCD). Your calls to this method display the assigned colorization of data into heights which can be seen via the path profile. The call for path profile LOS also includes options to display graphical representations of water, such as lakes or rivers and highlighted areas of your path that may cross over or through an airport runway (airport data in USA only at this time). Experienced microwave designers will tell you these are must-have features! Help understand and scope out project goals/expectations in partnership with the client. Serve as a liaison between Wireless Applications Engineering Team and the client side engineering team. Schedule regular meetings to update client on network-critical deadlines. This call returns the entity owners of spectrum for a given location throughout the USA, including the radio service type, the amount of spectrum and the frequency ranges either owned or leased. Wireless Applications breaks down the boundaries to the smallest carved out territories for accurate results giving analysts the detail to truly understand the telecom ‘chessboard'. With these calls, users are given the power to compare ownership of a BTA level versus research that reveals ownership of somebody that only has two and a half counties and a sliver of the 10 MHz allocated. And not only is the ownership data available, but users can also make calls to return the actual vector graphics of the custom carved boundaries. Integrate calls to search for Microwave Paths as well as protected Polygons. This search may be performed via Lat/Lon location coupled with a radius, or by a specific boundary box, or by specific Call Sign. Many engineers may not be aware of all the unique properties to microwave, the first being that the radio services cover a very large frequency range of spectrum and second is that they are made up of multiple types of transmissions, such as Point to Point, Point to Repeater, Point with Radius, and Closed Boundaries of which some amount of paths will operate within. The Wireless Applications API calls can return all of these types relative to your request. 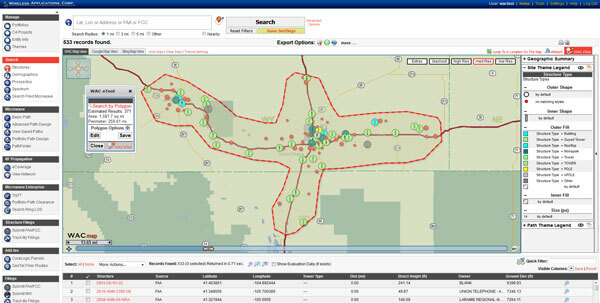 For example, if you request a location with radius and your designated search circle intersects even a small corner of any licensed microwave Polygon boundary, the call will return the record and the details to display the microwave boundary. That same search will also return any A to B paths that intersect the search circle by either one or both their end points or even if the path crosses overtop your circle. These calls return all the information for generating a graphical presentation of each path and/or the underlining entity and design data assigned to it. As the information age continues to migrate to smart phones, there are more and more telecom infrastructure professionals searching for the ideal locations to place antennas. Over the 10+ years that Wireless Applications has been in existence, the team has amassed databases of telecom structures. Every week the team sifts through new data expanding these databases. Using these calls, search the 1M+ records in multiple databases within the United States for telecom structures relative to a given Lat/Lon location and radius or relative to a given boundary (multiple options). 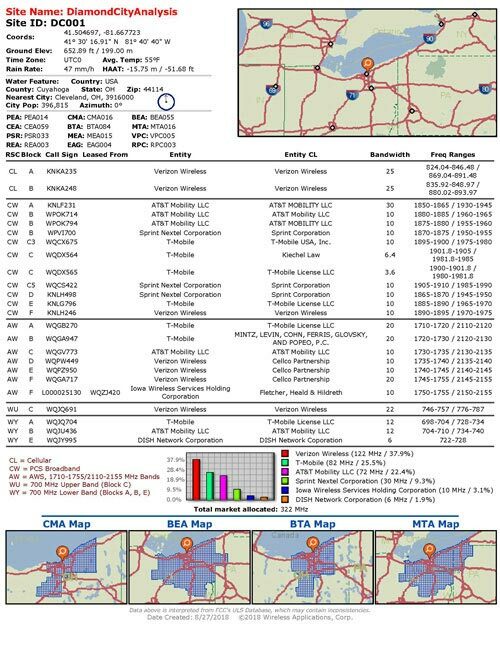 The multiple database include "FAA" &dash; FAA Determinations, "FCC" &dash; FCC Antenna Structure Registrations (ASR), "MW" &dash; Microwave Filings, "MWAPP" &dash; Microwave Application Filings, and "TC" &dash; Tower Company Records. For TC, either the Tower Company passes their tower data to Wireless Applications, or we pull the publically available data into our one convenient database. This call allows for developers to search the databases by geometric definition over geography (search ring or polygon or state, etc. ), and/or by other parameters such as tower height and tower owners. The results may be queried for data only returns or may also be queried for graphical representation returns such as displaying the ‘dots' in a Bing, or Google Maps API. All the fields for the records are available for your team to return and display or integrate into your site or software.